Allison Holley is pictured here with Alex Trebek, who has been the host of Jeopardy! for the past 33 years. Photo provided by Allison Holley and Jeopardy Productions, Inc. This show is known as “America’s favorite quiz show,” and this past Thursday, Feb. 16, a current Lawrence student competed in its annual college tournament. What is “Jeopardy!”? 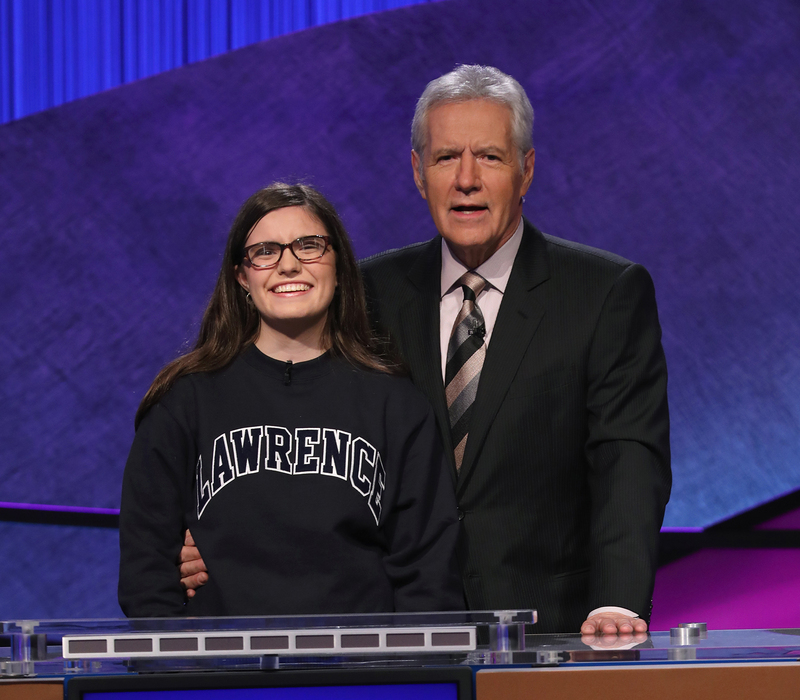 Holley, an English and Spanish double major, is the first student from Lawrence to compete in the “Jeopardy!” College Championship since the tournament first started 29 years ago. In early January, Holley flew to California to film the episode along with 14 other college students from around the country. Holley was the only contestant in the 2017 tournament from a school in Wisconsin. In the first round of the tournament, she competed against Mohan Malhotra a freshman from New York University and Cory Schmalzle, a senior from Lehigh University. Holley was narrowly beaten by Malhotra and finished in second place. While she will not be advancing to the next round of the tournament, Holley did not leave empty-handed. Apart from the cash prize awarded to the contestants, Holley is sure to remember her time on the show.